Photographing locally is one of my favorite things to do. There are so many photo opportunities at our doorsteps that we sometimes like to overlook. There are plenty of Macro Photography subjects like insects or flowers. There is your local village or if you lucky like me Boston is really close by and provides endless inspiration. There are local parks, sanctuary or lakes that make for great Nature Photography. Taking photos at your door steps provides easy access and keeps travel expenses low. Your photography is not heavily impacted by unfavorable weather conditions as we easily can re-schedule for the next day when conditions are more favorable. 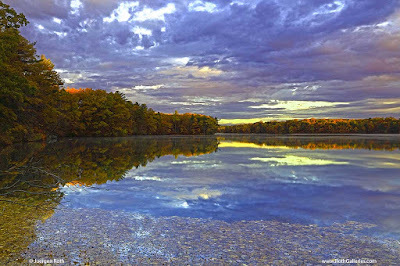 In recent weeks I explored the nearby Lake Cochituate in Wayland, MA. I went to a spot that is located right off Route 9 and only a few minutes away from my house. Sunrise was the last time I visited and let me tell you it was a real stunner. Ones the sun surpassed the horizon the tree tops were painted in beautiful hues. The cloud cover added its own drama to the image while the immediately foreground of the lake was covered with fallen leaves. The stillness of the morning made for a great reflection of autumn colors and colorful sky. I used a polarizing filter to boost colors and saturation while overcoming the high contrast between the foreground and brighter sky by placing a split neutral density filter mainly across the sky. During the digital post processing steps I removed unwanted imperfection and dust spots before adjusting lighting, contrast, color saturation and sharpening the final photography image of Massachusetts Sunrise.